Solid State Welding is a welding process, in which two work pieces are joined under a pressure providing an intimate contact between them and at a temperature essentially below the melting point of the parent material. Bonding of the materials is a result of diffusion of their interface atoms. Dissimilar metals may be joined (steel – aluminum alloy steel – copper alloy). Forge Welding is a Solid State Welding process, in which low carbon steel parts are heated to about 1800°F (1000°C) and then forged (hammered). Prior to Forge Welding, the parts are scarfed in order to prevent entrapment of oxides in the joint. Forge Welding is used in general blacksmith shops and for manufacturing metal art pieces and welded tubes. No filler material is required. Weld may be contaminated by the coke used in heating furnace. Cold Welding is a Solid State Welding process, in which two work pieces are joined together at room temperature and under a pressure, causing a substantial deformation of the welded parts and providing an intimate contact between the welded surfaces. As a result of the deformation, the oxide film covering the welded parts breaks up, and clean metal surfaces reveal. Intimate contact between these pure surfaces provide a strong and defectless bonding. Aluminum alloys, Copper alloys, low carbon steels, Nickel alloys, and other ductile metals may be welded by Cold Welding. Cold Welding is widely used for manufacturing bi-metal steel – aluminum alloy strips, for cladding of aluminum alloy strips by other aluminum alloys or pure aluminum (Corrosion protection coatings). Bi-metal strips are produced by Rolling technology. Presses are also used for Cold Welding. Cold Welding may be easily automated. Friction Welding is a Solid State Welding process, in which two cylindrical parts are brought in contact by a friction pressure when one of them rotates. Friction between the parts results in heating their ends. Forge pressure is then applied to the pieces providing formation of the joint. Carbon steels, Alloy steels, Tool and die steels, Stainless steels, Aluminum alloys, Copper alloys, Magnesium alloys, Nickel alloys, Titanium alloys may be joined by Friction Welding. 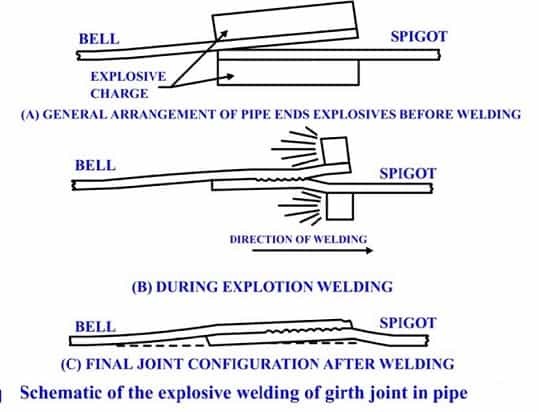 Explosive Welding is a Solid State Welding process, in which welded parts (plates) are metallurgically bonded as a result of oblique impact pressure exerted on them by a controlled detonation of an explosive charge. One of the welded parts (base plate) is rested on an anvil, the second part (flyer plate) is located above the base plate with an angled or constant interface clearance. Explosive charge is placed on the flyer plate. Detonation starts at an edge of the plate and propagates at high velocity along the plate. The maximum detonation velocity is about 120% of the material sonic velocity. The slags (oxides, nitrides and other contaminants) are expelled by the jet created just ahead of the bonding front. Most of the commercial metals and alloys may be bonded (welded) by Explosive Welding. Surface preparation is not required. Safety and security aspects of storage and using explosives. Explosive Welding is used for manufacturing clad tubes and pipes, pressure vessels, aerospace structures, heat exchangers, bi-metal sliding bearings, ship structures, weld transitions, corrosion resistant chemical process tanks. Diffusion Welding is a Solid State Welding process, in which pressure applied to two work pieces with carefully cleaned surfaces and at an elevated temperature below the melting point of the metals. Bonding of the materials is a result of mutual diffusion of their interface atoms. In order to keep the bonded surfaces clean from oxides and other air contaminations, the process is often conducted in vacuum. No appreciable deformation of the work pieces occurs in Diffusion Welding. Diffusion Welding is often referred more commonly as Solid State Welding (SSW). Diffusion Welding is used in aerospace and rocketry industries, electronics, nuclear applications, manufacturing composite materials. Welds of high quality are obtained (no pores, inclusions, chemical segregation, distortions). No limitation in the work pieces thickness. The mating surfaces must be precisely fitted to each other;Relatively high initial investments in equipment. Ultrasonic Welding is a Solid State Welding process, in which two work pieces are bonded as a result of a pressure exerted to the welded parts combined with application of high frequency acoustic vibration (ultrasonic). Ultrasonic vibration causes friction between the parts, which results in a closer contact between the two surfaces with simultaneous local heating of the contact area. Interatomic bonds, formed under these conditions, provide strong joint. Ultrasonic cycle takes about 1 sec. The frequency of acoustic vibrations is in the range 20 to 70 KHz. Thickness of the welded parts is limited by the power of the ultrasonic generator. Ultrasonic Welding is used mainly for bonding small work pieces in electronics, for manufacturing communication devices, medical tools, watches, in automotive industry. Moderate operator skill level is enough. Work pieces may bond to the anvil. CW: process is performed at room temperature using high forces to create substantial deformation (up to 95 per cent) in the parts to be joined. Surfaces require degreasing and scratch-brushing for good bonding characteristics. Cold pressure spot welding: for sheet-metal fabrication using suitably shaped indenting tools. Forge welding: the material is heated in a forge or oxyacetylene ring burners. Hand tools and anvil used to hammer together the hot material to form a solid state weld. Commonly associated with the blacksmith’s trade and used for decorative and architectural work. Thermocompression bonding: performed at low temperatures and pressures for bonding wires to electrical circuit boards. USW: hardened probe introduces a small static pressure and oscillating vibrations at the joint face disrupting surface oxides and raising the temperature through friction and pressure to create a bond. Can also perform spot welding using similar equipment. Ultrasonic Seam Welding (USEW): ultrasonic vibrations imparted through a roller traversing the joint line. Ultrasonic soldering: uses an ultrasonic probe to provide localized heating through high frequency oscillations. Eliminates the need for a flux, but requires pre-tinning of surfaces. Ultrasonic insertion: for introducing metal inserts into plastic parts for subsequent fastening operations. Ultrasonic staking: for light assembly work in plastics. FRW: the two parts to be welded, one stationary and one rotating at high speed (up to 3000 rpm), have their joint surfaces brought into contact. Axial pressure and frictional heat at the interface create a solid state weld on discontinuation of rotation and on cooling. Friction stir welding: uses the frictional heat to soften the material at the joint area using a wear resistant rotating tool. EXW: uses explosive charge to supply energy for a cladding sheet-metal to strike the base sheetmetal causing plastic flow and a solid state bond. Bond strength is obtained from the characteristic wavy interlocking at the joint face. Can also be used for tube applications. DFW: The surfaces of the parts to be joined are brought together under moderate loads and temperatures in a controlled inert atmosphere or vacuum. Localized plastic deformation and atomic interdiffusion occurs at the joint interface, creating the bond after a period of time. Superplastic diffusion bonding: can integrate DFW with superplastic forming to produce complex fabrications. Solidworks software used by many of the manufacturing companies in india. So that being a mechanical engineer need to know the updates in this software. Many thanks for sharing this blog post.